Looking for new and fresh outfit ideas? Wanna something eye-catching and unique? Ready for bold clothes combinations? If you answered three times ‘yes’, then you should continue to read this article, for sure. 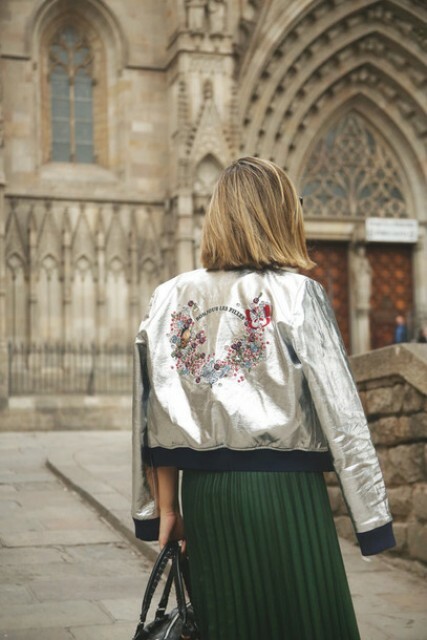 Today I want to share with you adorable and so cool metallic bomber jackets. I’m sure you know what the bomber jacket is (and maybe already have one) and how comfy and easy-to-combine it is, so all you need is to pick up a right color for your new item (silver, golden, bronze, pink, emerald, etc.) and start to create special looks with it. Scroll down to get inspired. 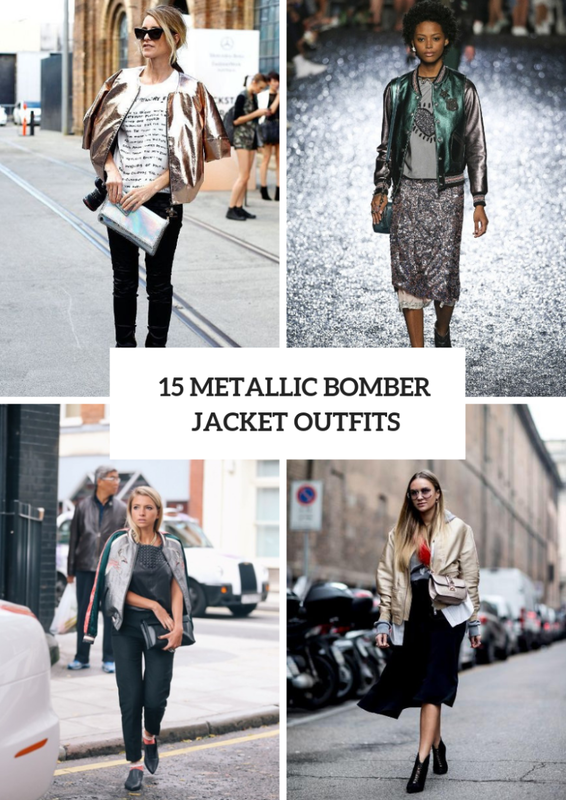 Actually, a bomber jacket is a sporty chic piece of clothes, so you can make sporty looks with it just taking a black and white sweatshirt and combining it with distressed cuffed jeans, white sneakers and a silver bomber jacket. 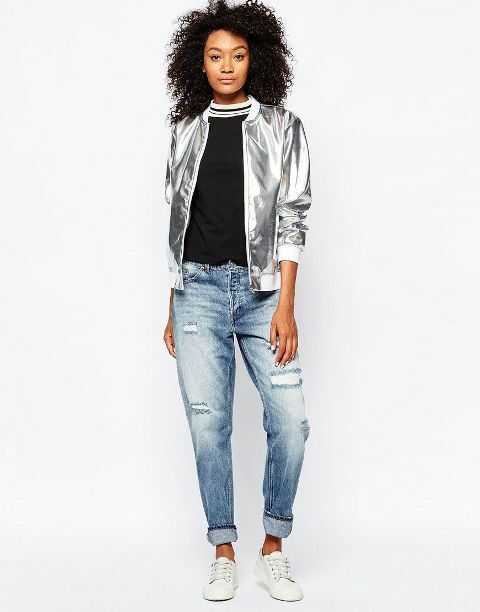 For creating a casual outfit you can take a t-shirt and pair it with a metallic bomber jacket, dark colored flare pants, black patent leather flat boots and a printed small bag. 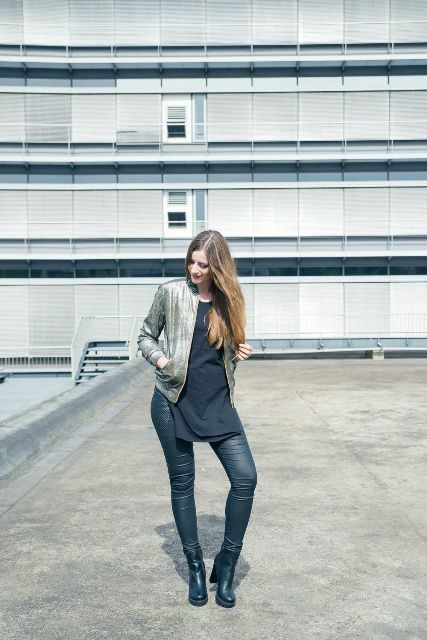 Or you can mix a black leather shirt with black straight pants, flat shoes, a silver bomber jacket with colorful sleeves and a black leather clutch. For an eye-catching everyday look you can take a white shirt and combine it with a black leather skater skirt, a golden bomber jacket, animal printed ankle boots, sunglasses and a marsala leather bag. Or you can choose a gray hoodie sweatshirt and pair it with a black midi A-line skirt, black lace up ankle boots, a beige metallic jacket and a crossbody bag. 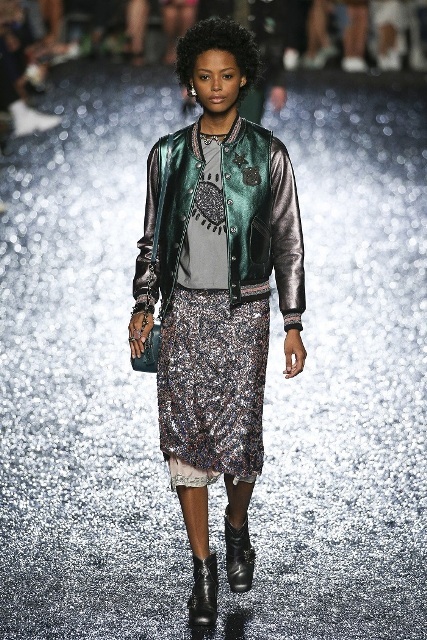 For parties you can mix a gray shirt with a glitter midi skirt, a metallic emerald and silver jacket, a small bag and a gray patent leather ankle boots.